Looking for a new lip balm fix? I’ve got one to share with you! These are Epic Blend lip balms. 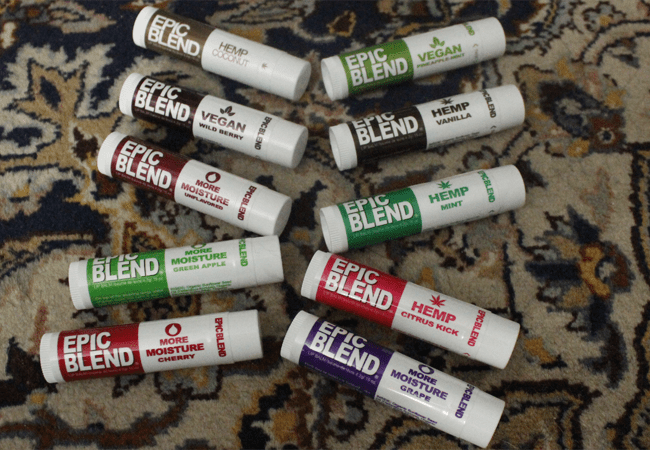 Epic Blend is an all new Canadian brand (Kelowna-based). Epic Blend is cruelty free, gluten free, paraben free and some products are vegan. These lip balms are made with all natural organic ingredients. Epic Blend comes in multiple formulas, all of which work wonderfully. There are also a ton of flavors available! These do an excellent job of hydrating the lips, especially the more moisture with the shea butter. My one complaint is that there are no Epic Blend lip balms with SPF. So while I’ve been enjoying using these, I still have to use my SPF 30 lip balms if I’m going outside. I hope that they decide to add an Epic Blend with SPF, preferably the Pineapple-Mint Flavor! I’ve been using Pineapple-Mint and Cherry the most and my lips have been nicely hydrated. My favorite flavor of the lip balms that I’ve received is the Pineapple-Mint! It’s delicious! What do you think of Epic Blend? What flavor would you want to try the most? Omg I’d love to try the banana one but I’d probably HAVE to go with moisture as my lips get so dry 🙁 too bad they don’t have that in banana or mint. Wild Berry and Green Apple sound awesome! Thanks for reviewing these- I’ve been hesitant to try them, after so many waxy, disappointing lip balms. I agree about the SPF! These are awesome as they are but if they also had sun protection they would be absolutely perfect. I might check these out, I like finding new lip balms that actually work lol. I’ve been using Merry Hempsters lip balm and it works pretty well, if you haven’t you should check them out! They have both vegan and non-vegan versions of their products. I’ll have to check out Merry Hempsters. I’m a big fan of shea butter in lip balm because it really helps my lips. I have one of these waiting for me to start use it at home. I know what my next lip balm will be! Yay I hope you love it!